Automatic database backups and database restoration (through the web client) have been added to Pleasant Password Server. With the addition of database backup and restoration easy database migration is now also available. Note: These features have moved in the web client, and can now be accessed from the Settings tab (in versions 7.9.7+). Previously they were located in the Advanced tab. Note: Without the backup encryption key, you will not be able to restore your database from a backup. This page allows you to set how often the backup is run, how many backups are kept, the key used to encrypt the backup, the name of the folder where the backups will be stored, and the prefix given to backup filenames. Store this Encryption Key: You will need this same encryption key to restore from files backed up with this process. Recommend Daily Backups (after work hours): This backup process can be intensive, and it is best to run after hours if possible, recommended daily on weekdays. Running more than this (i.e. hourly) on the default database may cause performance problems. and if the account that runs the "Pleasant Password Service" has permissions to that network share. See "Change the Service Account User" for additional info. We recommend keeping a sufficient number of backups, and periodically archiving in another secure location. Enable Automatic Database Backup: Enables the automatic database backup to run. Schedule: How often and what times the backup process runs. By default the database backups are configured to run every Saturday night at 2300 (11:00 p.m.). Number of Backups: The number of backups kept in storage. New backups created by the process will cause the oldest backup file (with the same prefix in the backup folder) to be overwritten. Note: Reducing the number of backups will remove the older backup files. Encryption Key: The key used to encrypt the backups (32 character maximum). Note: This key is needed when Restoring a Backup. Changing the folder name will not delete the old folder, but will create a new folder with the specified name the next time a backup occurs. The <Random Suffix> ensures backup files are uniquely named. Changing the Filename Prefix will prevent backups with the old prefix from being overwritten. Note: While it is possible to run the database backup process while the server is actively being used, best practice is to only run backups when no one is using Password Server. Note: The Save button is only enabled when there have been changes made to the database backup form. Backup Occurred - "User <Backup Restore Service> backing up database to <\\networkShare\yourFolder...>"
Error details may be found by following: these instructions. 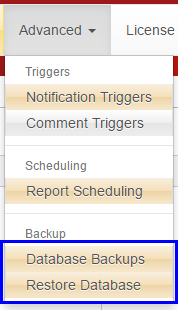 After saving a backup configuration, trigger a manual database backup by clicking on the Backup Now button. If there are pending changes to the backup configuration the Backup Now button will be disabled. Backup progress can be seen from the Logging page. This page lets you pick a backup to restore. Warning: Restoring a backup overwrites the current database - if it has not been backed up, it will be gone for good. Also note that you will not be able to use Password Server while the database is being restored. 1. (Optional) Click Backup Now (see above, in Database Backups). 2. Enter the same Encryption Key used to create the backup file (under Advanced tab > Database Backups > in the Encryption Key field), to restore the database. 3. Select a backup file stored on the server: click the backup file you wish to restore. Confirmation message: "Are you sure you want to overwrite your current database? This action cannot be undone." Succeeded: The database has been successfully restored. If you have restored a database from a previous version of Password Server, it is recommened you restart your Password Server service (or IIS site) after the restoration is complete. This means no file was selected. Click to select a file and try again. Wait for the service/site to start, then restart the service/site one more time. The log will indicate Success or Failure and the filename of the newly created backup file. Any additional error details may be found by following: these instructions. Stop Pleasant Password Server and change the database to the one you want to migrate to. Ensure the server is properly connected to the target database. Restore from the Database Backup file that was previously saved.